He was a surveyor and a cartographer known, particularly, for having completed the first map of Japan by conducting actual surveys in the 18th century. He was born in Kujukuri（外部サイト） in 1745 and grew up in Yokoshibahikari（外部サイト） in Chiba Prefecture. At the age of 17, he married into the Inoh Family in Sawara Village and succeeded to the headship of the family. He was very active in public duties as the headman and the guardian of village officials, as well as in his family business. 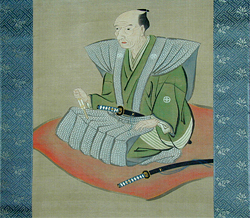 Between his 55th and 71st years (1800–1816), he led ten actual surveys, which covered all parts of Japan. The maps he created based on those surveys received praise in Europe for their high levels of accuracy. In addition, his maps served as the basic geographic data even throughout and after the Meiji era (1868–1912). The Inoh Family had held the position of the village headman for generations and had been the dominant family. The retail premises, front gate, study room, and storehouse in the former residence have been designated as National Historical Relic Sites since April 25, 1930. 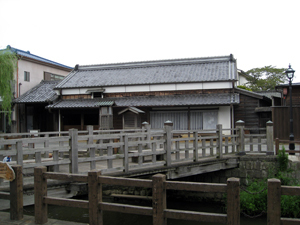 In addition, a part of the agricultural canal made in the Edo period (1603–1868) remains within the former residence. Water from a built-in gutter of a bridge in front of the former residence gushed into the Onogawa River, making sounds similar to “jar-jar” (a Japanese onomatopoetic word for gushing water). Since then, the bridge has thus been called the Jar-Jar Bridge, where water is controlled to gush out every 30 minutes. "First, never lie or do wrong to others, and stay honest to everybody. Demonstrate filial piety and obedience to your parents. Be loyal and sincere to your siblings. Second, consider the opinions of not only your elders and betters, but also those of the younger ones and your inferiors and adopt the reasonable ideas. Third, behave with cordial respect for others. Choose the modest language and never get in conflict with others." 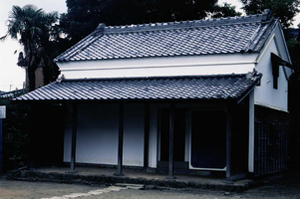 With the inscription of repair work of 1821, this storehouse with thick mortar walls is the oldest in existence in Sawara. This structure adopted a mortar sliding door. However, this design was later on replaced with a double-door design. 1751 6 His mother deceased. His father, Sadatsune left for his original family home with his children except Tadataka. Youth He studied medicine under an unknown doctor in Tsuchiura（外部サイト）.There is no specified record for this period. 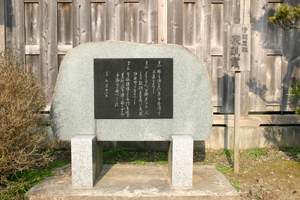 1781 36 Became the headman of Honjuku Unit of Sawara Village. 1784 39 Resigned his post as the headman and became the guardian of officials of the village. 1794 49 Retired. The headship of the family was transferred to his son, Kagetaka and he announced himself as Kageyu. 1804 59 Submitted the Map of Eastern Japan to the government and was shown to the Shogun Tokugawa Ienari. From then on, he became a Shogunate official. 1821 "The Dai Nihon Enkai Yochi Zenzu" or "the Map of the Japanese Coastal Areas" (214 sheets of the large scale, 8 sheets of the medium scale and 3 sheets of small scale) and "the Record of Survey Results Throughout Japan" (14 rolls) were completed. 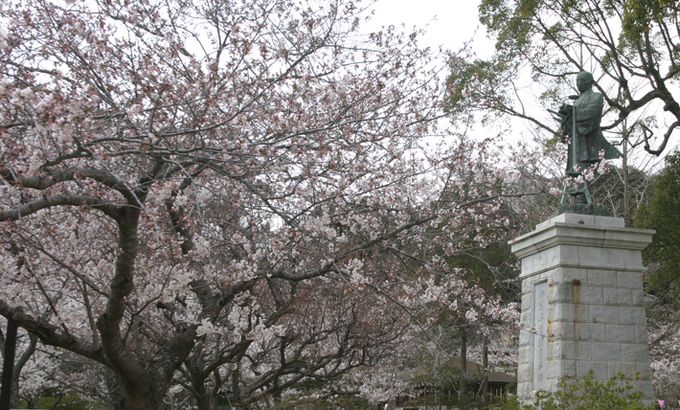 Fully bloomed cherry blossoms in the park attract visitors in spring. On a 5.5 m high base, the statue stands 3.3 m tall, depicting Inoh Tadataka surveying. The statue was created by Mr. Ujihiro Okuma, a pioneer of modern sculpture in Japan, and donated by volunteers in Sawara in 1919. 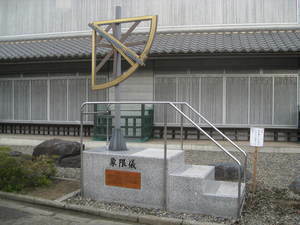 The Object of Quadrant is located behind the museum.